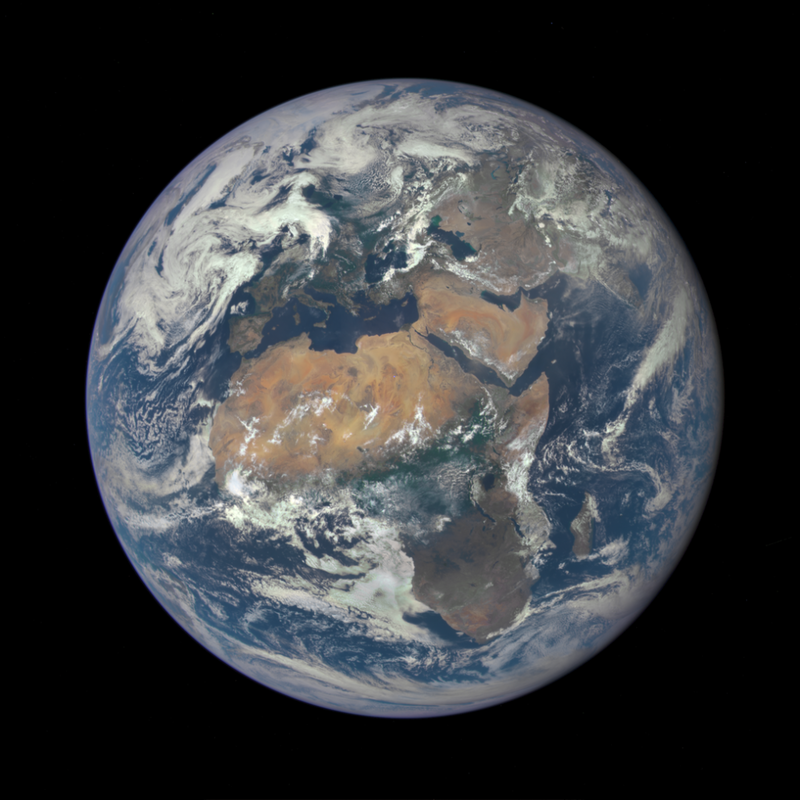 July 30, 2015 – Africa can be seen in this image of Earth taken by a NASA camera on the Deep Space Climate Observatory (DSCOVR) satellite. The image, taken July 6 from a vantage point one million miles from Earth, was one of the first taken by NASA’s Earth Polychromatic Imaging Camera (EPIC). Central Europe is toward the top of the image with the Sahara Desert to the south, showing the Nile River flowing to the Mediterranean Sea through Egypt. The photographic-quality color image was generated by combining three separate images of the entire Earth taken a few minutes apart. The camera takes a series of 10 images using different narrowband filters — from ultraviolet to near infrared — to produce a variety of science products. The red, green and blue channel images are used in these Earth images. The DSCOVR mission is a partnership between NASA, the National Oceanic and Atmospheric Administration (NOAA) and the U.S. Air Force. DSCOVR will trigger early warnings whenever it detects a surge of energy that could cause a geomagnetic storm. Geomagnetic storms occur when plasma and magnetic fields streaming from the sun collide with Earth’s magnetic field. These large eruptions from the sun have the potential to cause major disruptions to power grids, aviation, telecommunications and GPS systems. DSCOVR was launched in February to its planned orbit at the first Lagrange point or L1, about one million miles from Earth toward the sun. It’s from that unique vantage point that the EPIC instrument is acquiring images of the entire sunlit face of Earth. Data from EPIC will be used to measure ozone and aerosol levels in Earth’s atmosphere, cloud height, vegetation properties and a variety of other features. Ball Aerospace & Technologies Corp. developed the advanced radiometer instrument – called Scripps NISTAR – working with the National Institute of Standards and Technology (NIST) and the Scripps Institution of Oceanography. The instrument is designed to measure the Earth’s total reflected and emitted energy in the 0.2 to 100 micron range. This will help scientists better understand the energy exchange between the Earth and sun. Ball also provided DSCOVR with the CT633 star tracker.